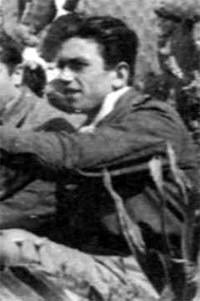 Marian Mazurek was born on 15 August 1920 at Böhne. He joined the Luftwaffe at the outbreak of World War 2. Mazurek underwent flying training with Flieger-Ausbildungs-Regiment 21 at Magdeburg. By July 1942, Mazurek was serving with JG 53 based on the Eastern front. Unteroffizier Mazurek was assigned to 1./JG 53. He recorded his first victory on 26 July, when he shot down a Russian MiG-1 fighter near Olginskaya. On 13 August, Mazurek claimed a Russian I-153 biplane fighter, a MiG-3 fighter and a Il-2 Sturmovik ground attack aircraft shot down to record his fifth through seventh victories. Mazurek claimed 20 victories in September, including three Il-2 Sturmoviks shot down on 7 September (10-12), four Russian aircraft shot down on 9 September (13-16), three Russian fighters on 11 September (18-20) and four enemy aircraft shot down on 18 September (22-25). In late-September 1942, I./JG 53 was relocated to the Mediterranean theatre and bases in Sicily. Mazurek recorded his 30th victory on 15 October, when he shot down a RAF Spitfire fighter over Malta. He shot down a further two Spitfires on 16 October (31-32). Operating over Tunisia from November 1942 to May 1943 to counter the Allied landings in North Africa, Mazurek added a further two victories to raise his victory total to 34. He was awarded the Deutsches Kreuz in Gold on 12 January for 32 victories. Following the fall of Tunisia, Mazurek and I./JG 53 were based at Catanaia in Sicily. On 25 May 1943, Mazurek shot down his first, and only, four-engine bomber, a USAAF B-17 west of Stromboli for his 35th, and last, victory. On 9 June 1943, Feldwebel Mazurek engaged USAAF B-24 four-engine bombers near Palazzollo. In the ensuing combat, Mazurek was shot down and killed in Bf 109 G-6 (W.Nr. 15 266) “White 16”. Marian Mazurek was credited with 35 victories. He recorded 29 victories over the Eastern front, including 10 Il-2 Sturmovik ground attack aircraft. Of his six victories recorded over the Western front, one was a four-engine bomber.